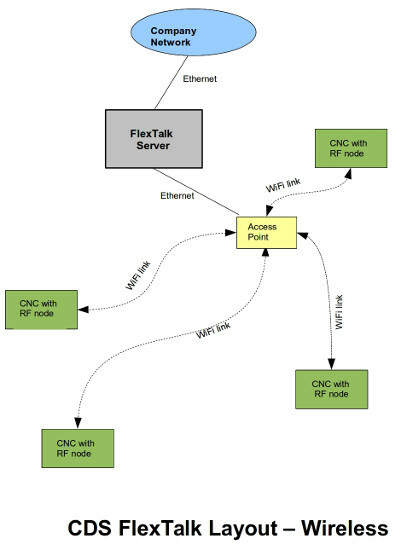 The FlexTalk ™ Communication System is a revolutionary way for transferring CNC programs between a computer and the CNC machine. It allows for the simultaneous drip feeding / loading of multiple CNC machines from a single PC. The Linux Talk™ Software allows for the up / downloading of CNC programs between a Computer and a CNC control. for Manufacturing, Process Control etc. Determining the causes for poor production manually is virtually impossible. The CDS DCS (Data Capture System) captures data directly from the machine / processes. The data can be manipulated and put into reports to give statistical information for better management and planning purposes. This allows the user to define concepts such as utilization to suit their requirements and specifications. The CDS Data Capture System (DCS) can be tailored to address the customers specific needs. Web server technology gives the user access to the data from any web enabled device. The Guard clocks the ID Points on his route. The Baton data is transferred with the Upload station to the Computer. The information is only available on the Computer on which the Software and the Upload station are running. The Guard clocks the ID Points on his route. At the guard station he transfers the data to the Magcell unit. The Magcell unit automatically sends the information to the Online Guarding system, via cellular infrastructure. The Online Guarding system is available anywhere, anytime, from any device with Internet Access.